Please note rugs are made to order, so please allow at least 4 weeks for delivery. Alternative Flooring offers you two sample size options. A 10cm sample for your moodboard or a larger 45cm sample to help you make that all important decision. Please note, to show the pattern, the Quirky Collection is available as 17cm and large samples only. Order and pay for samples via our website, provide proof of flooring purchase from one of our retailers, and you will qualify for a Free Natural Flooring Care Kit worth £35.00. 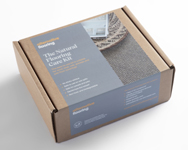 It's always worth having one of these handy Natural Flooring Care Kits to hand in case of spots and spills. Along with full instructions, you will find 'absorption' granules and spot remover. The Care Kit is based on natural products and is environmentally friendly. Don't want to pay for samples? The smaller 10cm samples are available, free of charge*, from any of our retailers. Simply contact them directly and they will organise for the samples to be sent to your home. *Excluding samples from the Quirky Collection, Quirky B Collection and Zoffany Boutique Collection.